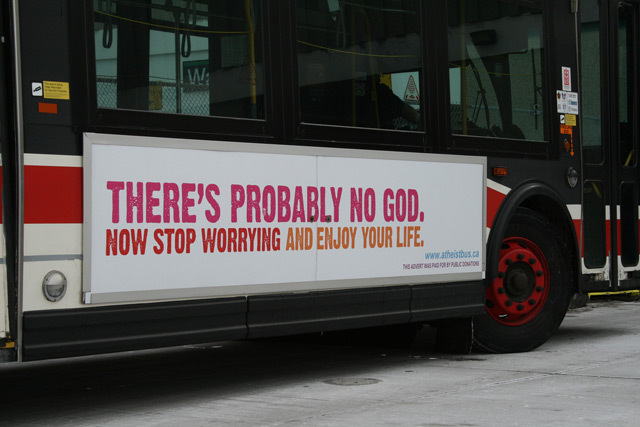 Photos from the Canadian Atheist Bus Campaign. 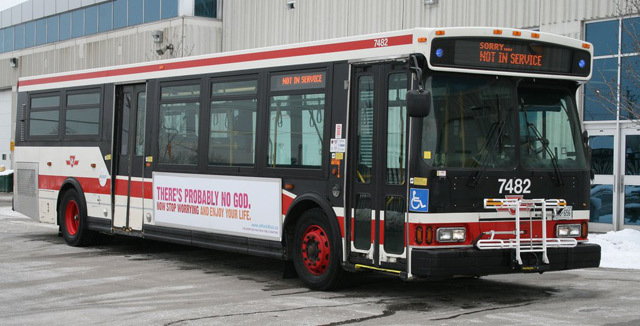 The Freethought Association of Canada, who solicited donations to pay for the ads and who received approval from the TTC and CBS Outdoor for them last month, told Torontoist that the ads started appearing on buses about a week ago, but that the organization was only able to catch and photograph one of the busses this past weekend (above). And, sure, the United Church has already issued its response, and in Calgary the Islamic Supreme Council of Canada is planning to book bus ads of their own to counter the impending atheist ones. But creating a dialogue is entirely the point, and the Atheist Bus folk are obviously happy and relieved that their busses are finally out in the wild somewhere, writing on their website that “it’s nice to finally see this in Canada isn’t it?” That’ll have to be the last word; God, unfortunately, could not be reached for comment.